Produttori del Barbaresco is the benchmark producer of Barbaresco. Always reliable in quality, they represent remarkable value too. And with their 9 single-vineyard riserva cru's, you get a look at the nuances of the various terroirs of Barbaresco. Though 2011 was a warmer than ideal year, it is considered a good vintage in Barbaresco, with wines on the riper, richer, darker, sexier end of the scale, but with good tannic structure and sufficient acidity, giving them serious ability to age. The fruit is by no means roasted or raisiny, as may happen in hot years. In short, 2011 vintage in Barbaresco is a vintage of considerable early appeal, but with serious capacity to age. Here are my impressions of the 2011 line-up from Produttori del Barbaresco, in the order I tasted them. There was a clear familial similarity among all the wines, including the Normale bottling. They were suave, rich, ripe, and tannic, shifting from red berries to blueberries and plums, hints of herbs and spices, with medium body and beautiful translucent garnet color (as typical for Nebbiolo). I would not call this a classic vintage for Produttori because the wines are quite rich, but nonetheless, they are delicious, perfumed and structured. They can also be enjoyed now with some decanting and food. 2014 Produttori del Barbaresco, Langhe Nebbiolo - before diving into the 2011's, we started with the impressively drinkable 2014 Nebbiolo. Supposedly a crap vintage, one expects top-grade juice to be declassified into the Nebbiolo Langhe, and indeed it showed. Very perfumed red fruits and herbs. Perfect (imaginary) match to a Naples-style pizza. 2011 Produttori del Barbaresco, Barbaresco Normale - this is blend of multiple vineyards from grapes that didn't make it into the single-vineyard cru's. Terrific value in 2011, for the quality and richness you get. I think this wine will age a long time, even though it already drinks very well. Perfumed berry jam, with noticeable structure and tannins. This punches way above its weight class. Tasted on at least 5 occasions with consistent notes. 2011 Produttori del Barbaresco, Barbaresco Riserva Paje - riper nose than Pora, some tea and blue fruit components, richer than Pora, plum, tannins kick in, beautiful, velvety blanket, leather, spice on the backend. Excellent! Tasted on two occasions with consistent notes. 2011 Produttori del Barbaresco, Barbaresco Riserva Ovello - more red fruited, more strict, drier than Paje, tannic and linear. This comes across cooler and more restrained, and I really like this for aging. Very good! Tasted on two occasions with consistent notes. 2011 Produttori del Barbaresco, Barbaresco Riserva Rio Sordo - less tannic, slightly more watery, a bit anonymous. 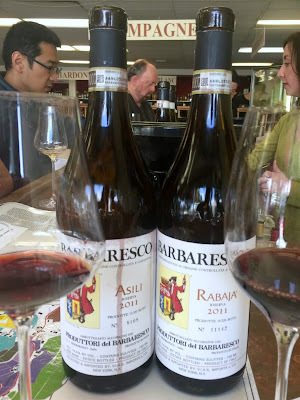 2011 Produttori del Barbaresco, Barbaresco Riserva Asili - tight nose, but I sense depth. On the palate, nearly silky, elegant spice, seamless balance, similar to Paje but more elegant, classier version. The most polished cru in the lineup. Beautiful symmetry in this wine. Paje seems a bit rustic by comparison. This is great! 2011 Produttori del Barbaresco, Barbaresco Riserva Rabaja - wow! darker, a fortress of Barbaresco, more dense and monolithic, this will go the distance, fanning out with age. A blanket of blue fruit buffering the considerable tannins that arrive later. A powerful Barbaresco destined for greatness! 2011 Produttori del Barbaresco, Barbaresco Riserva Muncagota - strawberry nose, red fruit on the palate, tannins in the end, not as complex as others, a bit anonymous. 2011 Produttori del Barbaresco, Barbaresco Riserva Montestefano - nice deep, ripe nose. Palate is ripe, spicy plum, blueberry, leather, long finish. Very good but a notch below Paje, Asili and Rabaja. 2011 Produttori del Barbaresco, Barbaresco Riserva Montefico - unfortunately I didn't get to taste this one. It was no surprise, I suppose, that the two most famous Barbaresco vineyards - Asili and Rabaja - were the two most impressive wines, followed by Paje, Ovello, and Montestefano, in that order. Notice on the photo, the Asili (on the left) is clearly redder and more translucent than the darker Rabaja. The Ovello and Rabaja were the most distinctive wines representing opposite ends of the spectrum - Ovello being cooler and red-fruited, and Rabaja being dark and rich. While some wines clearly stood out, there were no slouches in the lineup. Tasting these seductive wines filled my mind with images of Italian food - a board of charcuterie, a plate of thick pasta with wild boar ragu, a bowl of mushroom truffled risotto, a pot of short ribs with polenta... Yum! Who's hungry? !